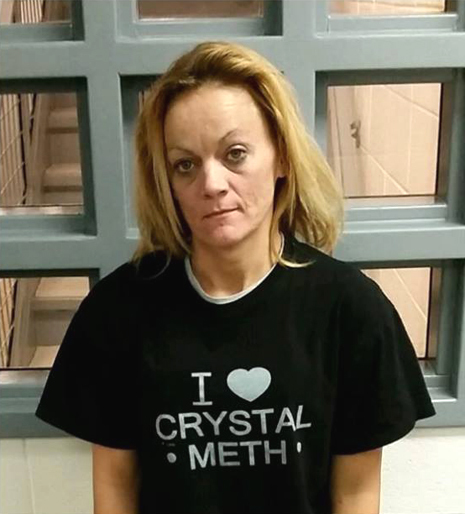 A grand jury has declined to indict the Kentucky woman who was wearing an “I Heart Crystal Meth” t-shirt when arrested last year for allegedly trafficking in crystal methamphetamine, court records reveal. Grand jurors in Laurel County last week voted “No True Bill” in the cases of Deborah Asher, 37, and codefendant Richard Rice, 57. The panel’s May 15 decision effectively dismisses felony narcotics charges filed against the pair, who were arrested last November “in possession of 3.37 grams of crystal meth and a set of digital scales,” according to sheriff’s investigators. Circuit Court documents show that “no witness appeared” before the grand jury, apparently prompting jurors to reject charges against Asher and Rice. A sheriff’s spokesperson said he was attempting to determine why investigators did not testify before the panel. Following Asher’s collar, cops circulated the above photo of her that was snapped at the Laurel County detention facility. Asher spent about three months in the jail before being extradited to Ohio to face unrelated charges. Rice is in the Laurel County lockup serving a three-year sentence in a narcotics case that preceded his arrest with Asher.